What happens when church marketing meets church history? Citizens of the German city of Wittenberg may soon find out. In honor of the 500th anniversary of Martin Luther’s arrival in Wittenberg as a student and a monk, the leaders of the Evangelical Church in Germany (EKD) have declared a “Luther Decade” — a plan to rebuild German Protestantism. Church leaders, it seems, are unhappy about the fact that only ten percent of Wittenberg’s population is Protestant. 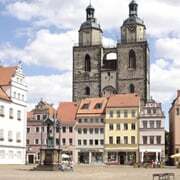 According to a recent article in Spiegel Online, they intend to remake Wittenberg into “a Protestant Rome,” a place for Protestant pilgrimage. To do so, they are bringing in “specialists on religious growth” (read: church growth) to help with these plans. One reason Protestants make up such a small percentage of Wittenberg’s population is because the city was located within the borders of communist East Germany for so many years, and religion was repressed. However, for those wishing to see more believers in Wittenberg, might we suggest that rather than turning to the methods of church marketers, they turn to the methods of the great Reformer himself? It was not the proliferation of gimmicks that sparked the Reformation. It was the proclamation of the Gospel. The Gospel is what is needed today, just as it was what was needed then.